summer educational experience that takes place outside the context of the regular school day. These hands-on, experiential, enriching chances to learn that build on, but don’t duplicate, what students are learning during the school day, and allow new and exciting ways to interact with the subject matter. The shortest answer is this: ELOs solve the problems of unsupervised kids, poor academic achievement and lost work productivity for parents. All of these things threaten our communities and Nebraska’s long-term competitiveness. 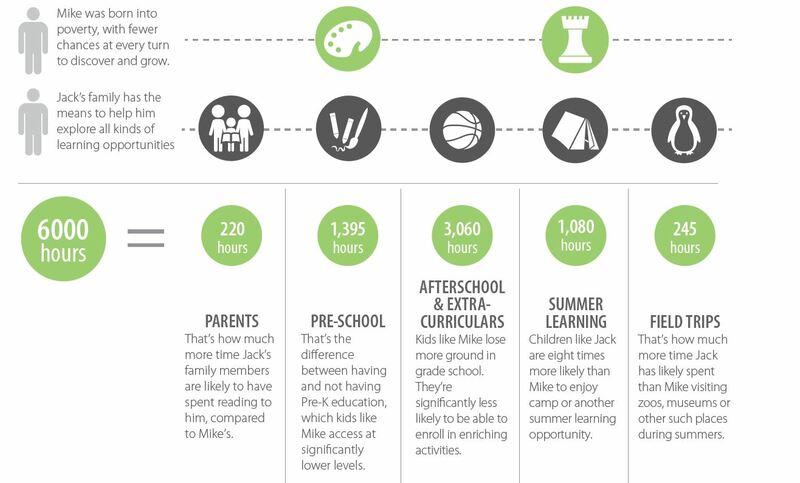 The Afterschool Corporation (TASC) pulled reviewed data from multiple sources and determined that the middle-income 6th graders have been exposed to about 6,000 hours more learning than their low-income counterparts. This gap represents more than just missed leisure and fun time. It represents a stark inequity in exposure to informal learning experiences. Every summer, teachers talk about the “summer slide.” where their low-income students have lost about 2 months of ground when it comes to learning. Their middle-income peers, on the other hand, have spent the summer participating in informal learning opportunities – museum trips, soccer camp, reading time at the library, camping – and have soared ahead. Exposure to ELOs – both after school and during the summer – can do much to narrow this gap. TO READ MORE, DOWNLOAD THE BIG BOOK OF ELOs IN NEBRASKA NOW.